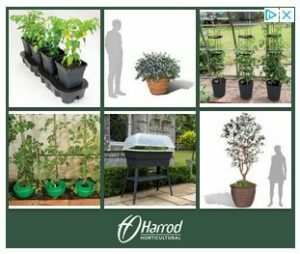 It wasn’t that long ago that the idea of growing tomatoes in a hanging basket or upside down planter seemed a bit unusual. Now it is fast becoming one of the most popular ways to grow tomatoes and the new varieties available for this type of growing show that this is the case. What is a Trailing Variety? 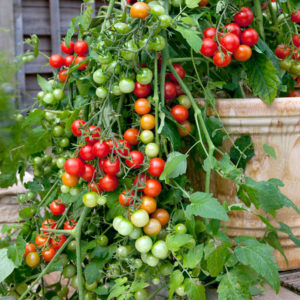 A trailing variety is a bush tomato plant that will grow in a confined space (small root area) with a sprawling growing habit. In other words, its branches grow long enough to hang down over the sides of a container producing a cascading or fountain like effect. The first very popular variety of this type was called Tumbler F1 and is still an excellent variety with a great taste and good yield. Then along came Tumbling Tom in both red and yellow strains. 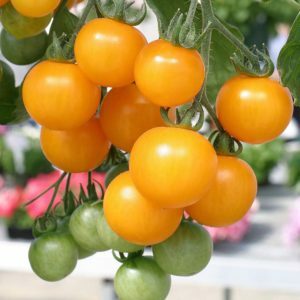 This variety is one of the most popular trailing tomato varieties today, partly because it looks so good, its produces a good crop with a very good taste. It also has a good shelf life and doesn’t split easily. The only disadvantages of Tumbling Tom is that it takes slightly longer to mature than Tumbler F1 and the fruit tends to be slightly smaller. These varieties include: 100s and 1000s which is a smaller cherry size (cocktail size really) but does produce an amazing crop, Maskotka, Gartenperle or Garden Pearl, Rambling Gold Stripe – very compact, Cherry Fountain, Ildi which is yellow and an established favourite, Tumbling Tom Junior, Bajaja and Cherry Cascade. 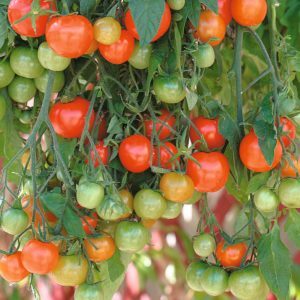 Some bush plants that produce cherry tomatoes aren’t suitable for hanging baskets because they have a non trailing habit and require some support or need more room for their roots than a hanging basket can give. These include, Red Alert and many of the small upright bush plants such as Balconi Red and Yellow which are great in window boxes and containers along with Venus, Vilma, Totem F1 and Sweet ‘n’ Neat to name but a few. Losetto F1, which is said to be blight tolerant, and other hybrid bush plants are probably best grown in large containers on the patio (more room for their roots) in order to take full advantage of their vigour and get the best possible yield. 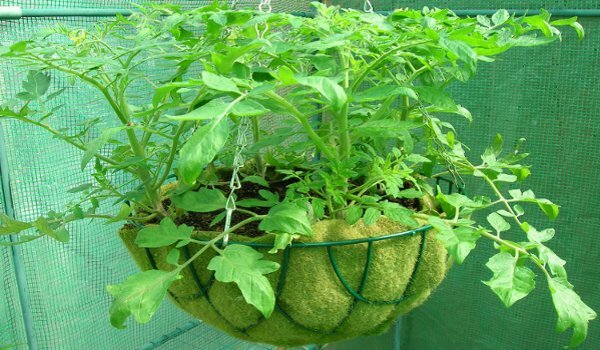 It goes without saying that if you wish to grow trailing varieties you need a high sided container or hanging basket so that the tomatoes can hang over the sides without touching the ground. Slugs and snails love tomatoes! Hanging baskets are great – especially as a visual feature but their disadvantage is that there is a limited amount of room for plant roots and the small amount of soil will hold less water than a large deep pot. A large pot or container with high sides will be more suitable in that tomato plants will produce a better crop, given more room. Adding perlite, vermiculite and water retaining gel crystals will help the soil absorb more water. This will mean that these containers won’t dry out on a hot day and your plants will be a lot happier! Tomato plants are prone to stress when moisture levels are up and down like a yoyo, and stress leads to a poorer crop of tomatoes. Try Lizzano F1 in the 2018 season – it is UK bred and ideal for baskets and containers – seeds from Suttons. The great benefit of growing tumbler cherry tomatoes is that most varieties are very sweet and usually mature earlier than medium and large tomato varieties! Tumbler Tomatoes and Trailing Varieties i have started growing theses for the 1st time ,does one nip out the side shoots >? Let the side shoots grow on tumbler and trailing varieties. I bought a basket of Tumbler tomatoes at the Farmer’s market this past Sunday. I’ve never grown them before. It’s been five days since my purchase, and the leaves are curling in. I’ve been watering the basket everyday. Temperatures here (Edmonton, Alberta, Canada) have ranged from 5C at night to 27C, with a midday average this week of about 17C. I haven’t put the plant in full sun yet, but it probably gets 3 hours of evening sun at the moment. I’m wondering if the curled leaves and twisted twirly ends of the stems are part of the normal growth for Tumbler tomatoes, or if my plant’s diseased. Most of the photos I’ve seen of Tumblers do have curled leaves, but I’d like your opinion, as your website offers the most information about Tumblers that I’ve come across thus far. My Tumbler’s leaves don’t look the same as my Early Girl, Sweet 100, or Lemon Boy. As you say, Tumblers often have curled leaves, especially their lower leaves, and it is nothing to worry about. However, if there is severe curl on the upper leaves and the leaves stop growing, it is either stress or disease – probably a virus. Plants can become stressed because of over watering or too much variation in temperature, but usually settle down after a week or two. Interesting to read about required space for root growth.. I’m thinking of deploying the Pot containment method. I’d be glad of your advice based on your own experience about this method. 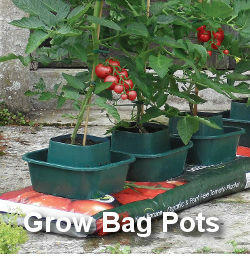 I intend to grow a few Ailsa craig , Sungolds, and Balconi Reds in various pot sizes ranging from 12” to only 5”. I got this idea from observing a Alicante side shoot I planted last year, which although contained in a 5 “ pot still managed to produce four trusses, although some of the fruits didn’t grow to full size. Balconi red should be ok in a 5 or 6 inch pot but I would use the biggest size for Ailsa Graig and the next size down for Sungold. The bigger fruited plants usually need the most root space. A side shoot will fruit sooner than a plant grown from seed, so it is true that cuttings can be successful in smaller pots. However, cuttings/side shoots will produce over a longer period in a bigger pot – the pot size may also affect the size of the fruit.